(Nanowerk News) Imagine printing out molecules that can respond to their surroundings. A research project at the University of Washington merges custom chemistry and 3-D printing. Scientists created a bone-shaped plastic tab that turns purple under stretching, offering an easy way to record the force on an object. "At the UW, this is a marriage that's been waiting to happen - 3-D printing from the engineering side, and functional materials from the chemistry side," said Andrew J. Boydston, a UW assistant professor of chemistry. He is corresponding author on a recent paper in the American Chemical Society's journal of Applied Materials and Interfaces ("3D-Printed Mechanochromic Materials"). 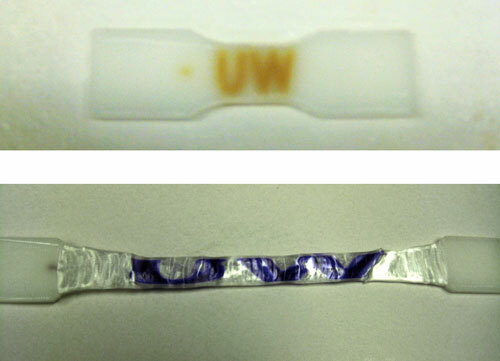 Gregory Peterson and Michael Larsen, UW doctoral students in chemistry, created a polymer, or plastic made up of many repeated units strung together, and fed the soft plastic into the UW chemistry lab's commercial 3-D printer. "We wanted to demonstrate that the functional chemistry could be incorporated readily into already printable materials," Boydston said. "We found that designer chemistry can be incorporated into 3-D printing very rapidly." The project is part of a recent collaboration between Boydston's group and co-authors Mark Ganter and Duane Storti, UW mechanical engineers who have developed new 3-D printing materials and techniques. Different instructions can program the machine to print the plastics in any configuration - with the color-changing part in stripes in the middle, completely encased in the other plastic, or in any other desired shape. Boydston specializes in organic synthesis, or, in his words: "It means making more complex molecules from simpler, more available ones." "Maybe the material isn't currently under stress, but it had been several times prior to your observing it. And so these types of materials could record that load history," Boydston said. "This is definitely an area that we want to continue to expand into," Boydston said.